It seems that its getting easier and easier to apply for–and receive–a credit card or a short term loan. Mailers arrive each and every day at our homes advertising special perks, airline miles, or one-time-only low fees to entice us to apply for a combination of loans or credit cards. There are ads on television and on the radio. Lending companies are even known to set up shop at colleges and universities across the globe offering free promotional t-shirts in exchange for a credit card application. As a result of these efforts, it’s not uncommon to hear heartbreaking stories of people trying to dig themselves out of massive debt. But all too often it’s not the debt alone that is the culprit. Before taking out payday loans, an unsecured loan, short term loan, or applying for any number of credit cards it is imperative you understand what an annual percentage rate is. Annual percentage rate, often referred to as simply APR, is is the price you pay the credit card or loan company for borrowing money–essentially the percentage you can expect to pay in one year in order to borrow money tomorrow. Many financial advisors suggest that consumers think of APR as a service fee. Borrowing money is one kind of service, and you must fork over some amount for said service–just as you would for a mechanic who fixes your car’s engine or a delivery fee for a driver who drops off a big online purchase at your door. That said, it always helps to read the fine print on any offer, as many companies allow consumers to avoid paying interest–or even an APR in full–if you make sure to pay your balance in full each month by a specified due date. For this reason, it’s important to remember that no loan or credit card works exactly the same. Do your research and be smart about how you borrow cash! What Determines The APR You Are Charged? Many lenders will first turn to an applicant’s credit score in order to accurately determine a loan or credit card’s annual percentage rate. Typically, the better your credit score the lower your APR. In addition to credit score, companies may also base your personal APR on details within your credit history. They may look to see if you have a tendency to pay your bills late or if you occasionally miss a payment. A good rule of thumb to keep in the back of your mind is that if you have a poor credit score–or any existing unpaid loans–you will likely have to fork over a higher APR because the lender will be worried that you l will not be able to repay the loan. However, it is imperative that you always read the fine print in full. In some instances, you may actually be able to negotiate a significantly lower APR with your lender. Additionally, some credit card or loan companies simply charge a fixed annual percentage rate, which basically means that the rate remains exactly the same throughout the loan’s life span, regardless of your personal credit score. But this is not the only alternate scenario. There are other lenders out there who elect to charge a customer a variable annual percentage rate. This can be confusing, as with a variable APR, rates can fluctuate both up and down based on a number of volatile factors, such as the health of the global stock markets. That said, don’t worry too much about these types of APR rates if you do elect to go with one. Lenders are not permitted to adjust APR rates without notifying you ahead of time. But it doesn’t stop there. Many lenders or credit card companies may also offer a low or reduced introductory APR rate in order to initially entice you to do business with them. Again, it’s incredibly important to carefully read all the fine print, as these offers may be almost too good to start, however, after a specified amount of them of time, the lender may increase the APR. Finally, it helps to keep in mind that payday loans, bad credit loans, and unsecured loans are notoriously expensive. Because of this it always helps to try and negotiate a lower APR. 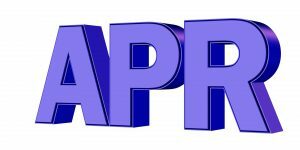 How Do Lenders Calculate APR? Step one: Divide the finance charge by the amount of the loan (this will be different for each person). Step two: Multiply the above result by 365 (for each day of a calendar year). Step three: Divide the result by the term of the loan (again, this will likely be different for everyone). Step four: Multiply the above result by 100.